Thompson is a small parish situated in the Breckland Local Government District. It contains the settlements of Pockthorpe and Thompson, and is some 4.5km south of Watton. The name ‘Thompson’ is thought to derive from a hybrid of the Old Norse and Old English words for Tumi’s Enclosure. The earliest recorded objects are a number of prehistoric flints (NHER 39740, 39742 and 39745) and pot boilers (NHER 39741). 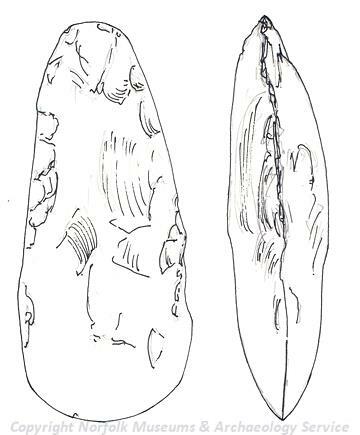 A number of Neolithic tools have also been recorded (NHER 8946), and these include a blade (NHER 29006), and three axehead fragments (NHER 8947, 39737 and 39744). 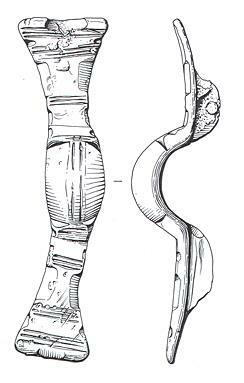 There have also been some Bronze Age objects discovered in this parish. 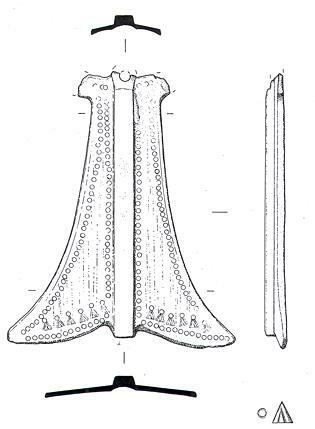 These comprise a Middle Bronze Age palstave (NHER 35791), a Middle to Late Bronze Age spearhead (NHER 31365), Late Bronze Age socketed gouge (NHER 35740), and a Late Bronze Age hammer (NHER 12725). Two coins from the Iron Age have also been recovered (NHER 35338 and 35792). No monuments from these periods have been discovered, and the earliest feature is a probable Roman ditch (NHER 37135) excavated near Thompson Hall Cottages. A small number of Roman objects have also been recorded, and these comprise coins (NHER 12725 and 35789), brooches (NHER 35792 and 31365), and a possible Roman vessel mount (NHER 36089). Although no settlements from the Saxon period have been discovered, a number of objects from the Saxon period have also been found. These include an Early Saxon pendant fragment (NHER 48967), an Early Saxon hybrid armed cruciform brooch (NHER 34532), a Middle to Late Saxon backwards turning beast brooch and finger ring (NHER 39736) and a concentration of Middle and Late Saxon objects including coins and a strap fitting (NHER 31365). Despite this evidence, the Domesday Book of 1086 does not consider the settlements to be particularly valuable or populous. The earliest surviving building in the parish is the church of St Martin’s (NHER 8958). The nave of this church was built around 1300, and the chancel and tower around 1340, and the majority of the features are in the Decorated style. Shortly after the establishment of this church, around 1349, Sir Thomas and John de Shardelow founded the chantry college of St Martin, Blessed Virgin Mary and All Saints (NHER 8951). The remains of this building, which was rebuilt around 1400, survive as part of College Farmhouse, although there were substantial alterations in the 17th to 19th centuries. The only other medieval sites are the earthworks of a medieval or post medieval hollow way (NHER 18087) and undated enclosures and a possible moat (NHER 31780). Objects from the medieval period have also been recovered, including a medieval copper alloy dagger handle (NHER 15797), a harness pendant (NHER 35792), and an ampulla (NHER 40119). During the early post medieval period one of the most important buildings in the parish was Thompson Hall (NHER 18086). The building was the home of the Tooke family until it was sold to the Walsinghams. It was demolished around 1800, and only the site of the building is known. A number of post medieval building of architectural interest have also been recorded, and these can be found in both the settlements in the countryside. One such building is Chequers Inn (NHER 24607), a 17th to 18th century timber-framed building with a 16th century core and clay lump infill. A number of other buildings have similar building materials, including Old Pastures (NHER 46300), a 17th century timber-framed building with clay lump infill and a thatched roof, as well as Hallfield Farmhouse (NHER 46137), which is situated on a brick plinth.